Owners of Cadwell Park, MotorSport Vision have had a bridge built over the stretches of track from the start-finish straight up to coppice and the run back round up to the mountain section to make it easier to move between viewing points on the circuit. Before, fans would have to queue and wait for marshals to allow pedestrians to cross on the order of race control. Obviously, on a busy weekend such as the August bank holiday British Superbike round, this would be difficult for both fans wanting to cross and race control. Due to having a jam-packed programme and needing to stick to times, race control could only open the gates when it was both safe to do so and they had the time to do so. This meant that the gates would only be open for a short period of time at irregular intervals, meaning that at busy events like BSB only some fans would get across in time. 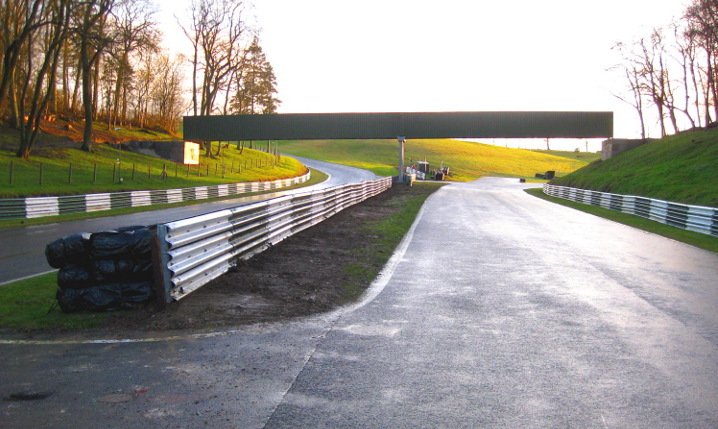 The bridge, 40 metres long and formed of two sections was erected by the Cadwell Park maintenance team over winter, battling the snowy conditions to complete the work on time. MSV claim that great care was taken when choosing the position of the bridge so not to obscure spectator views. The bridge should keep BSB advertisers happy, with an extra 80 metres of space to fix their boards to. Previous Previous post: Guest Blog: Filling the Stoner Void.